The major stock markets did not move much in the last week. A positive element of strong earnings mixed with a negative element of rising interest rates leads to a little change in percentage points. However, a trend analysis of the stock market’s big picture will definitely show a clearer picture. That’s what we’re gonna do in this market review again! Trade war fears were exchanged by Korean hugs among the top news, which is certainly a positive thing for stock market participants. The major stock market indices, still in consolidation, are building strong bases at the moment. 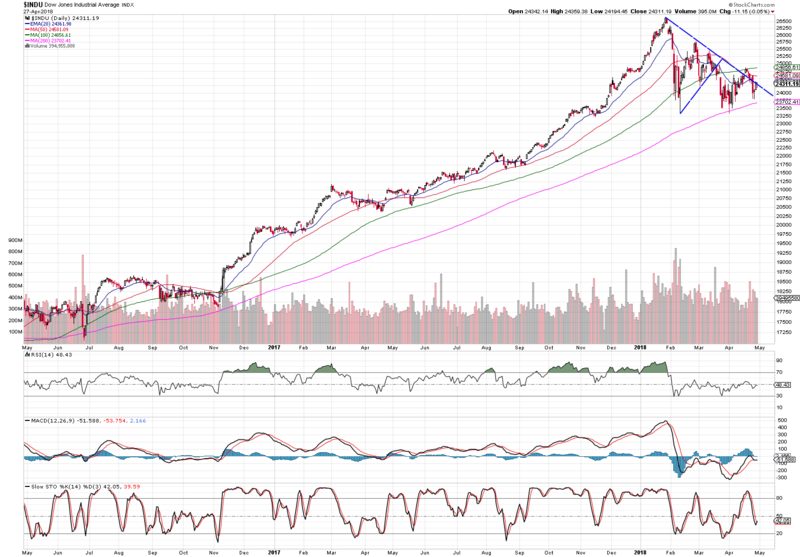 Sell in May and Go Away might not apply well this year, we might actually see a great momentum breakpoint in upcoming weeks which will lead to a further rise in stock prices. In the previous market reviews, I have demonstrated how to trade Nasdaq’s short-term movements. The price moved fine after resistance pierces and some gains could have been recorded. The price reverted down to its support in a meantime and now the game continues. 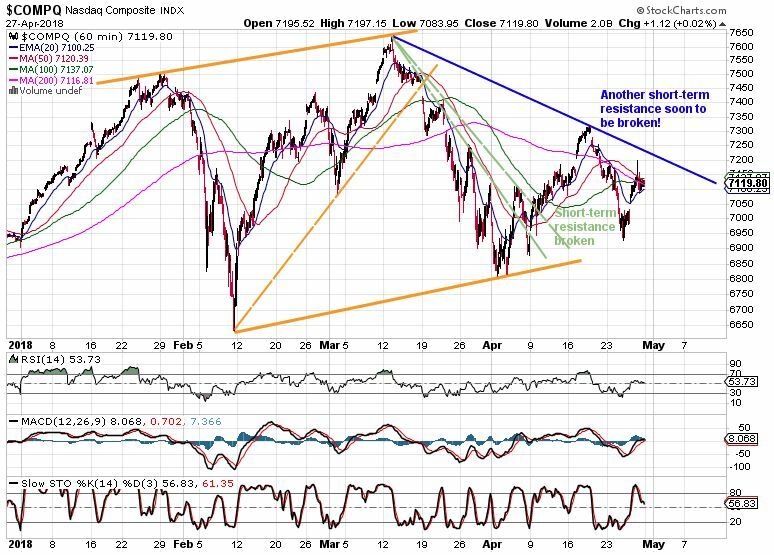 When looking below, the 60-minute chart depicts current consolidation channel (wide orange lines), broken support and resistance levels (dashed lines) and most important – current short-term resistance (blue line). Once the blue line is broken, the index will very likely increase again. The consolidation of S&P is building a descending triangle pattern. To complete, the bulls need to take a price above the upper trend line. This is what we are watching now! Dow has successfully broken a three-month resistance (blue dashed line) but failed to cross 100 MA. 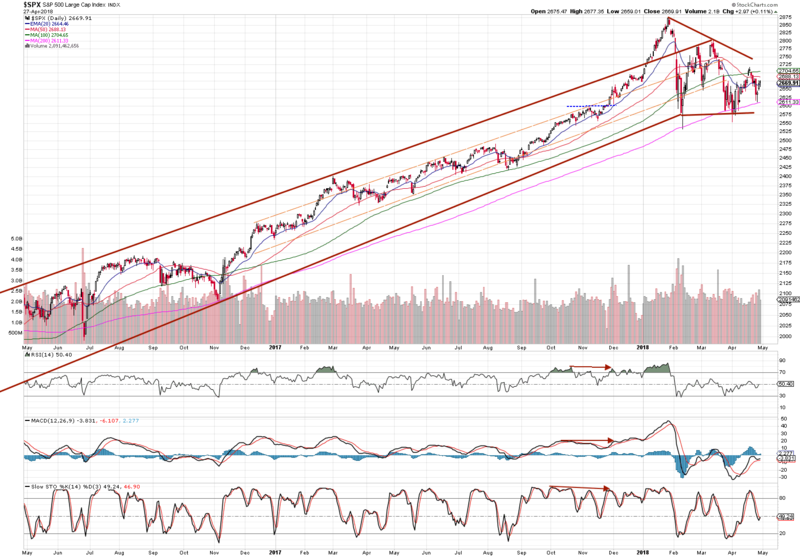 This needs to be broken, otherwise, it keeps bouncing between 100 and 200 Moving Averages. As already discussed above, the index is approaching its short-term resistance (blue line). 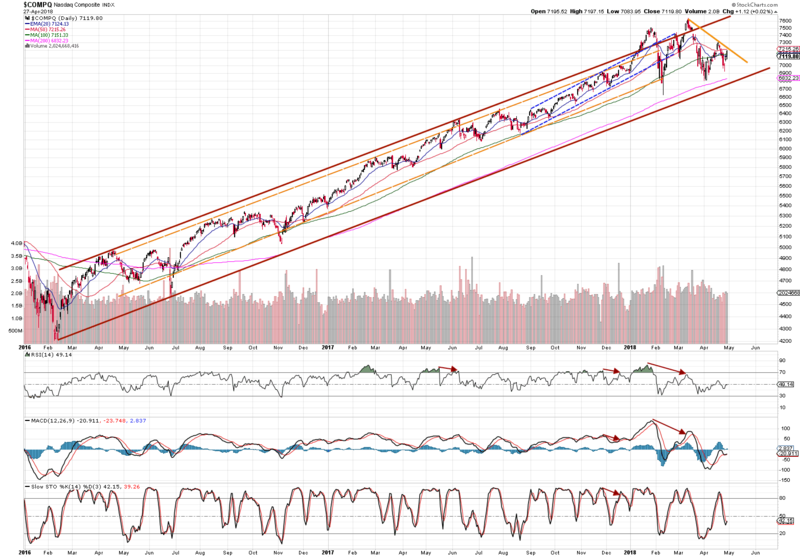 This is a top event of this market review and top momentum play to watch in following days/weeks. Well, well, well. FTSE keeps rolling, it has actually re-entered a trend channel. This is definitely good news, however, the resistance level is close and this is a place where price will very likely revert. Today’s market review suggests that long-term investors should see the current situation as a good buying opportunity in the bulk of healthy stocks. The market is awaiting Fed’s announcement on Wednesday, thus the successful traders will behave cautiously until the event. Let’s not make premature decisions, instead, let’s stay disciplined and focused on big trend!